It’s probably a fair assessment that there haven’t been too many successful new animated characters created in the last 30 years or so. Since the early 1970s, only Scooby-Doo, The Simpsons and Family Guy has really shown any kind of longevity with successive generations of animation fans. Beyond nostalgia value would anyone watch an episode of Jabberjaw (a Scooby-Doo knock off with a talking shark instead of a dog), Thundar the Barbarian, Carebears or Smurfs today? Probably not. There really hasn’t been many cartoon character from the 70s, 80s or even 90s that was created by an American animation studio lasted long enough to create an impression in pop culture besides the aforementioned three shows and considering the number of original animated series that was created over that time that is a depressingly low number. So it’s doubly unfortunate that the battle of wills that controlled the fate of Roger Rabbit has only succeeded in insuring that no new projects featuring the stuttering `toon star of the hit film Who Framed Roger Rabbit would ever come to fruition. But for a brief moment it did look as if we would see a continuation of Roger’s feature length adventures in addition to the annual shorts that Disney was producing. That follow-up story would have looked at how Roger came to Hollywood and fought in World War Two. The script for Roger Rabbit II: Toon Platoon opens on the Kansas farm of the Randall’s, Roger’s adopted family. It is Roger’s 18th birthday and his parents decide to tell him that he was left on their doorstep when he was a baby and that he isn’t even a human. “Now I know why all the guys at school stare at me in the shower,” realizes Roger. Roger decides to head out into the world to find his mother. While hitchhiking, Roger is picked up by Richie Davenport an aspiring actor on his way to Hollywood to make it big. Acting is Richie’s second choice of a career, as his fear of heights has blocked his desire to follow his father’s footsteps into the Army Air Corps. Richie doesn’t take much of a liking to Roger, especially after the ‘toon destroys his car. The two make their way to Hollywood and then go their separate ways. Roger hears an episode of the radio series Mr. Keene, Tracer of Lost Persons and, assuming that the radio character can help him, heads to the radio station and disrupts the live broadcast. There he meets the future Mrs. Rabbit, though she’s not as we know her from the first film. Jessica Krupnick may have her same sultry voice, but is dressed in some less than flattering clothes and seems oblivious of her own charms. Meanwhile, Richie is not having much luck getting acting work, discovering that good looking guys are a dime a dozen in Hollywood. He’s reunited with Roger when the ‘toon saves him from a fight with three Air Force recruits. He reluctantly moves into Roger’s apartment, where he meets Jessica and her human roommate Wendy who share an apartment in the same building. As Richie and Roger continue to their individual quests, they also begin to court Jessica and Wendy, even going on a double date to the movies. Richie finally gets cast in a film but Roger, who has stumbled into the studio thinking he saw his mother entering the lot, disrupts shooting. Although the director and a visiting studio executive think Roger has a future as a cartoon star, Richie is furious with him. Before he can yell at Roger for spoiling his big break, a nearby radio announces the news of the Japanese attack on Pearl Harbor. Meanwhile, Jessica, who has been growing suspicious of Otto, her boss at the radio station, has discovered that he is actually a Nazi spy. Otto kidnaps Jessica and Wendy and takes them to Germany, forcing Jessica into servitude as a Tokyo Rose-like propaganda personality. Eighteen months later finds Richie enlisted and with the army in Europe. When his fear of heights endangers his platoon in a firefight, he is reassigned to the same supply base where all the enlisted `toons have been assigned. It turns out that although `toons can’t be harmed by enemy bullets and bombs, human commanders couldn’t figure a way to get them to attack an enemy. It seems that the `toons innate urge to entertain was too difficult to overcome. At the supply base, Richie is reunited with Roger who is depressed that he has not received any letters from Jessica. While listening to the radio, Roger hears one of Jessica’s broadcasts. He convinces Richie and the `toons Blackie Cat and Swiftie Turtle to help him go AWOL and rescue her. Along the way, Richie conquers his fear of flying and the whole crew manages to foil a plot by Otto to assassinate Roosevelt, Churchill and Stalin at their famous conference at Malta. Writer Nat Mauldin, who had previously worked on the sitcoms Barney Miller and Night Court, crafted a script that not only captures the spirit of the first film, but also manages to expand on the concept of a world where humans and cartoon characters interact. What military commander wouldn’t love to have troops that could be repeatedly shot or blown up without being hurt? Of course, given the nature of most `toons, it’s obvious that putting them into combat would be the worst idea on record from a military standpoint. Of course, from a comedy stand point, the idea is pure gold. Mauldin has also added two new characters to Roger’s world- Swifty Turtle and Blackie Cat. Swifty bears a strong resemblance to the Warner Brothers character Cecil Turtle so much that as I read his dialog I heard it in Cecil’s voice. Blackie Cat is a hepcat who, in accordance with the laws of cartoon physics, is able to manifest bad luck, usually in the form of a falling flowerpot, for whomever’s path he crosses. The only real criticism I have for the script is that compared to Who Framed Roger Rabbit’s frenetic opening, Toon Platoon’s opening “Fade In on a Kansas Farm” just doesn’t pack as much punch. Given the influence the Warner Brothers cartoons have on the script, perhaps swiping the framing device from the Bugs Bunny short “A Hare Grows In Brooklyn,” where Bugs Bunny tells his life story to a Louella Parsons-type gossip reporter, would have been appropriate. 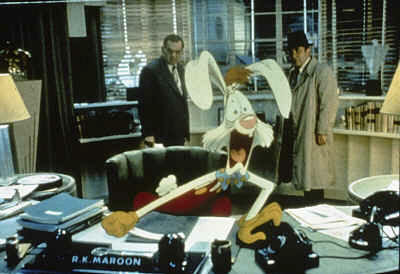 Who Delayed ROGER RABBIT 2? Do you know where I can find the whole script, please? Would love to read it! Thanks a lot! That script actually sounds pretty good. If they’d have used it 3-4 years after who framed RR it would’ve sat alongside it pretty well. Only downside is it might’ve become a franchise and would’ve got milked to death and then rebooted.